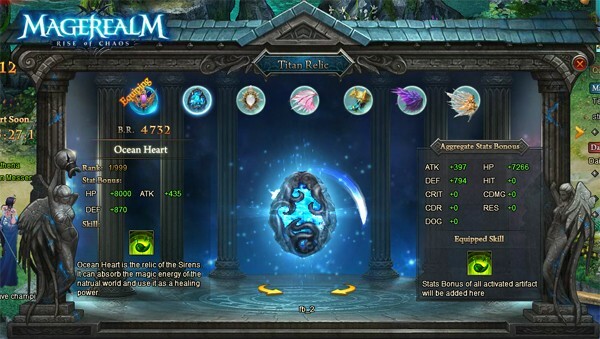 Magerealm has released the function of Holy Relic for a while and it has received mostly positive feedback. However, one remaining improvement that the team has long wanted to make was to make relics a more essential part of combat. 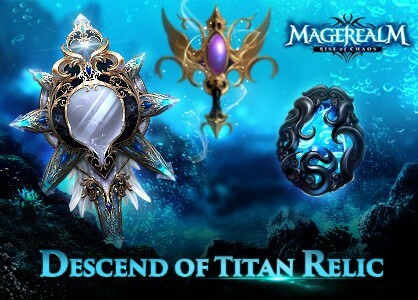 After comparing ideas we have decided to launch the Titan Relic, an all new relic system containing 7 collectible relics dating back when the Titan created the realm and could help players in the thick of battles, to Magerealm! Let’s first take a look at the different parts of the function and how it works. 2）Hone:Hone missions are a series of quests that grant players Titan Relic energy shards. They can be accessed through the link in PVE Panel. 3）Meld:After clearing the Hone missions, players can meld the Relic shards to form the relics and unlocking the Kindle Function. Players also get the initial stats of the relics. 5）Blitz: When the last chapter of the Hone missions, the Boss challenge is complete, Boss blitz of all Titan Relic stages are unlocked. Players can blitz the last Boss of all cleared Titan Relic stages. 3）Upgrading Relics do not level up character skills, but improve skill stats and effects. 4）Players can equip the Relic that can serve them best before heading into battle. As the Elven relic, the Divine Scepter has command over nature and possesses power of divination. The Elves lives deep in the Silver Moon Forest and worships the Moon Goddess and the Divine Scepter once belonged to her. The divine scepter has a ancient silver tint. The top of the scepter is crescent shaped and marked with runes. In the heart of the scepter is inlaid a large ivory pearl that resembles the moon. Ocean Heart is the relic of the Sirens. It can absorb the magic energy of the natural world and use it as a healing power. An azure gem from deep within the ocean's depth, this relic gives off a radiant turquoise glow. The gem is kept in and protected by metal carved like octopus tentacles. Mirror of Truth is the Human relic, and has the power to read minds. Mirror of Truth is housed in a metallic circle with 8 small protrusions around the edges each holding a smaller mirror made of diamond. When turned in any direction, the mirror emits waves of light and energy. Ancient runes and markings can be seen on the metal ring. The remaining four relics will be revealed soon, in the mean time, we hope you enjoy this new function and please don’t hesitate to tell us what you think!